Launched in 2014 as part of the National Defense Act that mandated assignment of forensically trained sexual assault personnel to military units, the SAMFE program provides 24-hour services, seven days a week to TRICARE beneficiaries 14 years and older, as well as non-beneficiary victims of on-post assaults. The forensic response team also provides support to those survivors from trauma to trial. 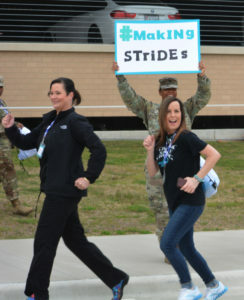 (From left) Carl R. Darnall Army Medical Center employees, Sheilah Priori and Sonya Woodson, step up their strides during the hospital’s 71-hour relay run/walk to demonstrate support for sexual assault survivors.